It seems absurd to call a $1,500/£1,400 turntable a steal, but that’s just what the Marantz TT-15S1 is. For the money, you get a gorgeous turntable that sounds incredible. The Clearaudio Virtuoso cartridge tracks beautifully, has excellent dynamic range and digs for details you didn’t know were there. If you’re becoming a serious vinyl collector, the TT-15S1 deserves an audition. The recipe for a great turntable seems simple. You need a rigid chassis that dampens vibration, a motor that keeps good time and a needle that can track record groves well. While the basic formula is the same for all turntables, the devil is in the detail. While most record collectors will be satisfied with the excellent sounding Audio Technica AT-LP120-USB or the Pro-Ject Debut Carbon, there are better turntables for those who truly value audio fidelity. One such turntable is the Marantz TT-15S1. Yes, it’s over three times the price of the Pro-Ject Debut Carbon, costing $1,500 (£1,400, AU$3,000) but it sounds monumentally better to the trained ear. 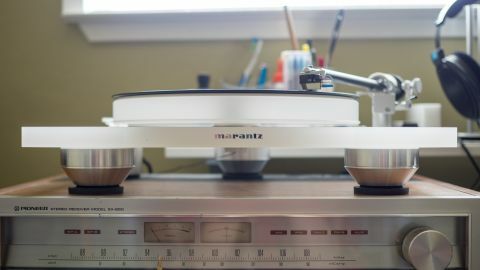 While the Pro-Ject was merely good at retrieving detail, the Marantz wows by digging into the grooves and extracting detail you never noticed before. It’s also a work of art. It seems almost absurd to call the Marantz TT-15S1 a bargain, but that’s exactly what it is. Here’s why. The Marantz TT-15S1 is stunning to look at. Its plinth is made out of a single piece of frosted acrylic with three beefy feet to dampen vibration from speakers and footsteps. This acrylic plinth has two cutouts for the tonearm and the motor. Speaking of, the tonearm itself is a work of art and comes out of the box wired and ready to go. You simply have to drop it in the hole, line it up and tighten a single set screw. If you’re using the included turntable mat, you’ll need to use the felt spacer included to space the tonearm up so that the vertical tracking angle is appropriate. The motor itself is completely detached from the plinth to control vibration. It seems odd at first but it actually works very well. The motor simply sits by itself and is connected to the frosted acrylic platter via a clear rubber belt. Speed changes are done manually by putting the belt on the appropriate pulley (33 ⅓ RPM on the smaller pulley at the bottom and 45 RPM on the bigger, upper pulley). This isn’t a big deal as the belt change takes a few seconds. However, there’s no ability to play 78 RPM records, which is a shame. The platter, similarly, is thick and heavy, and sits on a suspended spindle. Combine all of these elements together and the Marantz TT-15S1 has an incredibly dark background when playing records: There’s no hum from the motor, no audible vibration from the platter or plinth. All you hear is what’s on the record and nothing else. Marantz includes a simple felt slipmat in the box and a Souther Clever Clamp in the box to help stabilize records. You have the option of using the included flt mat or putting records directly on the acrylic platter. We recommend using the included mat as it sounds much better. The Souther Clever Clamp may work for stabilizing terribly warped records but it doesn’t make much of a sonic difference on normal records. While the included slipmat and clamp are perfectly acceptable, upgrades like a proper record weight and mat like the Herbie’s Audio Lab Way Excellent II make the Marantz sound even better. Setting up a new player is nerve racking as it requires assembly, however setup here is actually quite simple as Marantz includes a very well written set of instructions with pictures to guide you through the process. The included Clearaudio Virtuoso Wood cartridge was designed to work with the Marantz’s tonearm and simply needs to be seated as far forward as possible. You’ll likely need to tweak the turntable a bit after set up to make sure you’ve really dialed in the geometry so be patient. It’s a shame Marantz doesn’t throw in a basic cartridge alignment tool in the box, but you can pick one up for cheap. Thankfully, since the Clearaudio cartridge was chosen for this turntable, it sounds great out of the box when dialed to Marantz’s instructions. One thing to note is that he vertical tracking force isn’t easily determined by simply balancing the tonearm and adjusting the weight to the appropriate setting. We highly recommend picking up a vertical tracking force gauge like the Shure SFG-2 to properly set the weight. For the amount of money the Marantz TT-15S1 costs, it had better sound excellent. Thankfully, it does. The first time we dropped the Clearaudio Virtuoso Wood on a record, our jaws dropped as the turntable provided such dark backgrounds and dynamic range that we spent the first night rediscovering our record collection. All the work that Marantz and Clearaudio (the TT-15S1 is built by Clearaudio to Marantz’s specifications) put into damping and isolation paid off. The TT-15S1 provides silent backgrounds, which lets the music stand out more. Violin strings reverberate with authority and there’s an excellent sense of space. It’s this sense of space that separates the Marantz from entry-level hi-fi turntables like the Proj-ect Debut Carbon. The cheaper turntables just can’t match the sense of space or the inky dark background of higher end turntables like the Marantz. The Marantz TT-15S1 paired with the Clearaudio Virtuoso Wood provides an exceptionally neutral presentation. This means bass lovers will be disappointed by the lack of bass emphasis of this turntable. Bass is deep and textured but lacks the impact that some listeners may desire. If your audio system is a bit on the warm side, the TT-15S1 would be a complement to bring it back to neutral. However, if your system is already bright, the TT-15S1 may exacerbate the highs. Mids are excellent and female vocals like Norah Jones and Sia sound incredible with tons of texture and timbre. To many, the neutral presentation of the Marantz may sound a bit boring and at times too detailed. The TT-15S1 is unforgiving in the way it digs details. If a record was poorly mastered, you’re going to hear it. But for properly mastered records, the TT-15S1 is hypnotic. The Marantz TT-15S1 costs a lot of money but considering its design and audio fidelity, it’s a steal. To put it in perspective, the included Clearaudio Virtuoso Wood cartridge costs $1,000 when purchased separately. The turntable is not perfect, however. Setup requires a few additional tools to really dial in and it’s annoying that no dust cover is included. The included slipmat and record clamp are merely OK but the turntable deserves better. We also want to caution treble-sensitive listeners and bass lovers to look elsewhere as the TT-15S1 is uncompromisingly neutral. But all of these cons are simply minor annoyances. Taken as a whole, the Marantz offers budding audiophiles the chance to chase higher fidelity without having to buy a turntable that costs as much as a car. For audiophiles who are ready to graduate from entry-level hi-fi turntables, the Marantz TT-15S1 should be on your short list.